It will take some time to get this call and room built up, This call/room is in testing phase, we will sometimes start the conference call at random times when there is enough people participating, if you visit the conference call line page and the call is not active, just click on "Follow This" and you will be informed of when the next conference call starts. click on "Follow This" You may be asked to sign up for talkshoe, go ahead its simple. NOTE! There is no set time for this call, it will be started at random times once enough people are participating in the room/call. We will set a time later if we decide to host the call every day, it depends on how many people will participate, again we did not set a time on this event/calls, the calls do not have a set time, this facebook event was created to promote the call line and conferences. There is several methods for those who want to use their computer microphone to participate in the call, You can use any VOIP Voice over Internet Protocol software to participate in the call using your computer microphone. To download TalkShoe Live PRO while a call is active, Go to the OSI Conference Call page here http://www.talkshoe.com/talkshoe/web/talkCast.jsp?masterId=125472&cmd=tc once on the page click on the green and blue bottom box that says TalkShoe Live PRO, which will allow you to download the software. NOTE it's being reported that Talkshoe Live PRO is not working for some. If it doesnt work, try some of the below methods. NOTE Google Voice calls will automatically terminate after around 3 hours, so if you are using Google Voice on the call and the call drops you will need to dial back in when the call terminates. WARNING! *OPERATION BANISH* OSI Conference Call line, Scripted Relayed Harassment Activities WARNING! It has been reported to us, and we have witnessed ourselves during the last recent OSI conference line calls, there has been several individuals (SRI's) =Scripted Relaying Individuals that have called into the conference that have been relayed or sent what we call a planned Organized Gang Stalking (Street Theater Harassment Script) that was relayed to them by syndicated criminal individuals to Harass other Organized Gang Stalking victims on the conference calls. As of 12-27-2012 ANYONE that calls into the OSI conference line or enters the call chat room that we or any of our organization or crew detects is reading from any type of relayed script, YOU WILL IMMEDIATELY BE MUTED AND REMOVED FROM THE CONFERENCE CALL! and you're name will be posted on display to warn others that you are engaged in criminal scripted harassment activities of other victims online!. It has also been reported to us, and we have witnessed ourselves that these relayed scripted harassment activities are also taking place during FFCHS conference calls and other organization calls as well. If you are participating in these scripted relayed harassment activities then you have been manipulated into and ARE engaging in the criminal harassment of other individuals! and you and you're online information such as you're internet chat name, profile information and any other available details about you will be recorded documented and added to a lengthy list for future investigations and prosecutions pertaining to a criminal harassment conspiracy of other individuals under title 18 U.S.C. 241 : US Code - Section 241: Conspiracy against rights. So before you think about returning to our conference calls or call in reading from ANY type of relayed script, don't waste you're time and know that you will be immediately removed from the telephone call and added to several list's for investigation of yourself and investigation into who exactly it was that relayed the harassment script and harassful information to you! Scripted Harassment of other individuals or our organization on our conference line will NOT BE TOLERATED! and you WILL BE PROSECUTED! 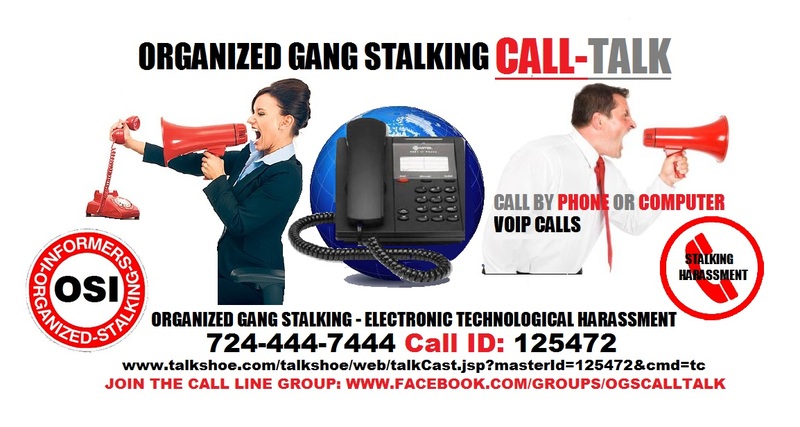 Organized Gang Stalking CALL TALK © 2013. Travel theme. Powered by Blogger.